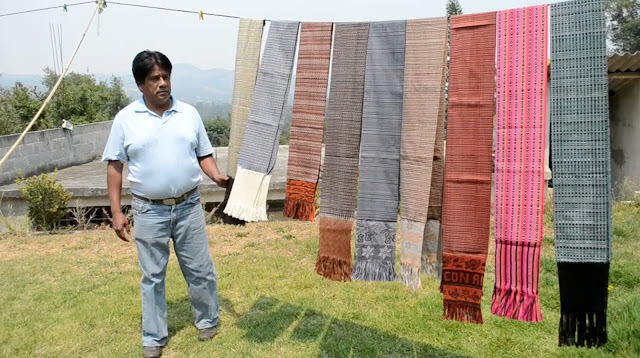 Take a stroll down the Zocalo in Oaxaca, or visit one of the open air markets in Tenancingo or Santa Maria del Rio, and you are certain to encounter women wearing a fine woven shawl called a "Rebozo". The Rebozo is a functional garment that in addition to providing warmth, serves as a carrying device for bundles and frequently small children. While the Rebozo is predominantly worn in more urban settings, you will find women as well wearing the Rebozo in major cities such as Guadalajara and Mexico City on special events and during festival days as a proud statement of their cultural roots and a national heritage steeped in artisan handicraft. Luis Rodriguez is a 3rd generation Warp Ikat Weaver living in Tenancingo, a village about 3 hours from Mexico City. He learned the art of warp ikat weaving from his father, as well as inventor of many time-saving tools used in the process. 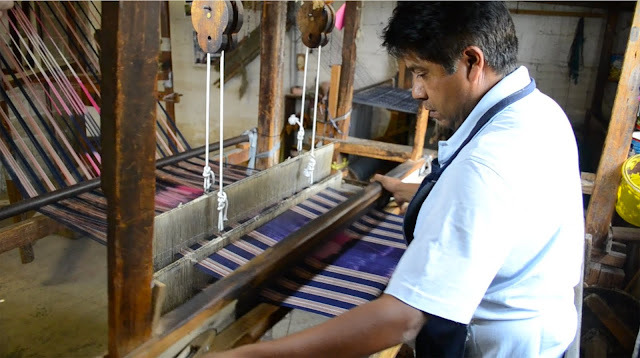 The traditional Ikat Rebozo is made entirely by hand in a process known as Warp Ikat. A pattern is conceived into a design, which is transferred to long strands of starched fibers using fugitive ink. A tight knot is placed by hand on or between marks. The knotted strands are soaked in water to remove the starch, and then dyed, revealing un-dyed areas on the yarns. Once placed in the loom, the warp fibers display the pattern which, with the application of the weft yarns, produces the popular, completed design. "My name is Luis Rodríguez. I'm from Tenancingo, México. My passion is rebozos made entirely by hand with the Ikat technique. This is something I learned from my parents. I'm the 3rd generation of my family dedicated to this art. Since 1800 we have been weaving with this technique. I still work the Ikat exactly as my parents taught me, but I also work and create with my own creations and designs. "Rebozos are my passion, I think I have it in my blood and flowing on my veins. When I was younger I tried to escape from this tradition, but when you have something in your heart, there is no way to escape from it, it is calling to you time and time again. "I'm always trying to encourage my kids into this kind of work, they are sometimes surprised of how patient I am, but when you love something, there is no patience needed. I get so focused on my handicraft that sometimes I forget about eating. "I don't imagine myself doing another kind of thing, another profession. The best part comes when I find myself surrounded by people telling me about how much they love my work, those moments are just hard to explain, because they tell me that I'm on the right path and those moments are also my fuel to keep up with this extraordinary tradition." 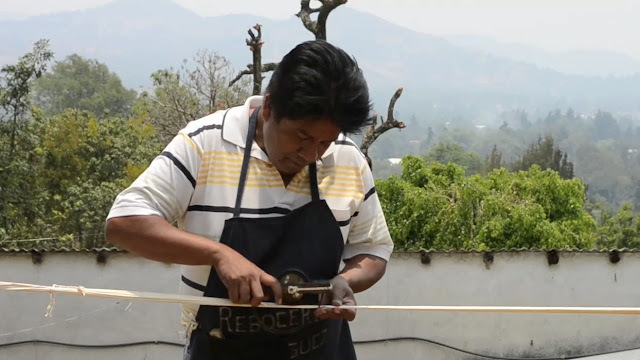 For traditional Mexican designs Luis uses a series of wheels which were created by his father. Made from copper, these wheels are marked with a fugitive (non-permanent) ink and then carefully rolled across long groups of threads. 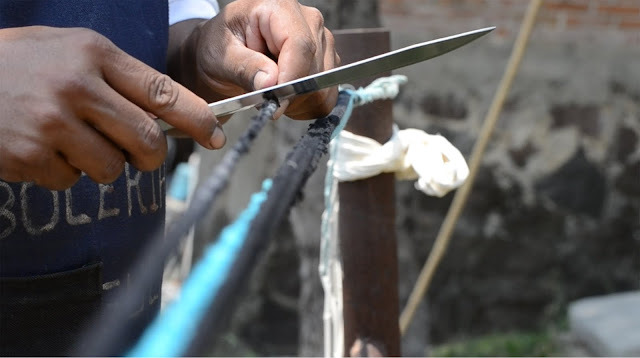 Knots are placed at the hashmarks either by hand or again by a clever knotting tool created by Luis' father which greatly speeds up the process. "This tradition was invited my father. These "molds" were made by my father too and I keep using them every time I start the Ikat process to make my rebozos. They are very useful for me, I save a lot of time doing this procedure. The patterns of the rollers are made by the traditional way to make rebozos but sometimes I give myself the chance to change a little the design, to play a little more and to be more creative on the results but always keeping the traditional rebozo style. 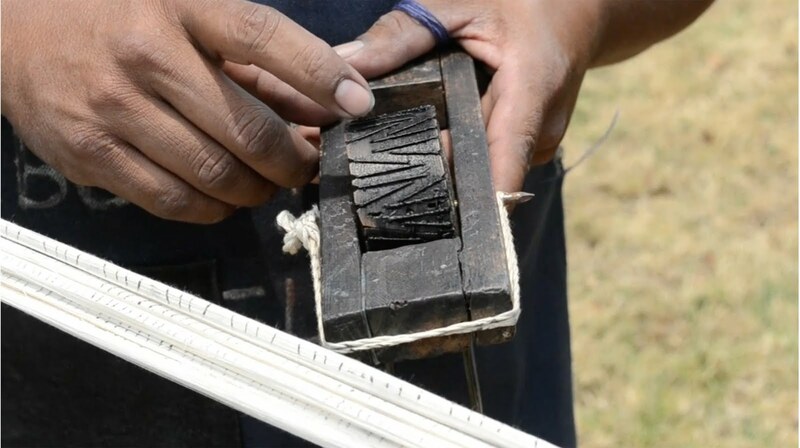 "First I put the ink directly on the wheel, then immediately I start rolling it over the tight yarn and the marks will show over automatically. When the marks are ready printed on the yarn, I start tying up in every mark a little yarn, once this is done I put the complete yarn into the dye vat." 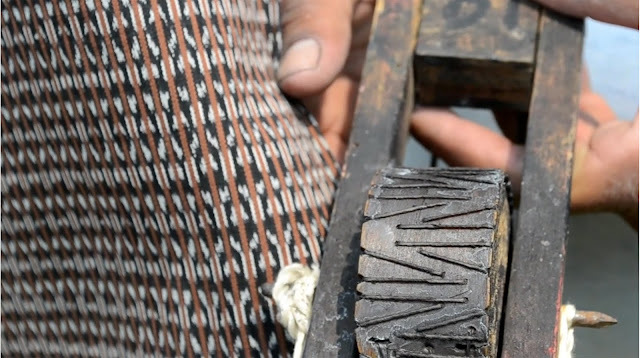 An Ikat print roller or 'impression mold' and the design it produces. "The [use of] flour is a tradition that was born a long time ago, I don't know exactly when, but I do know that before we used flour, weavers used corn -- the "Iztamal", which is used to make tortillas. 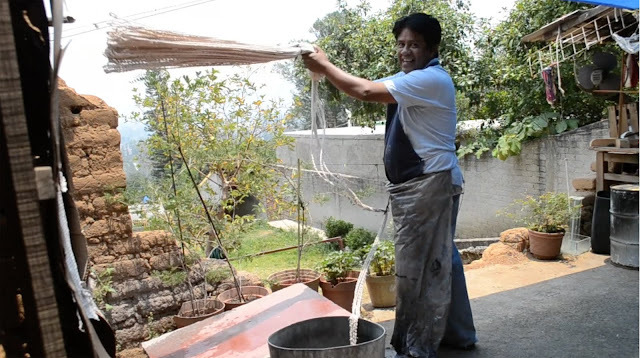 Now we use flour as a tool for Ikat because is cheaper and much better for the process; the flour makes the yarn hard and when the yarn is hard it splits into many different yarns which gives me the chance to work on more intricate designs. In other places, where the flour is not used, they have to work with only one design." 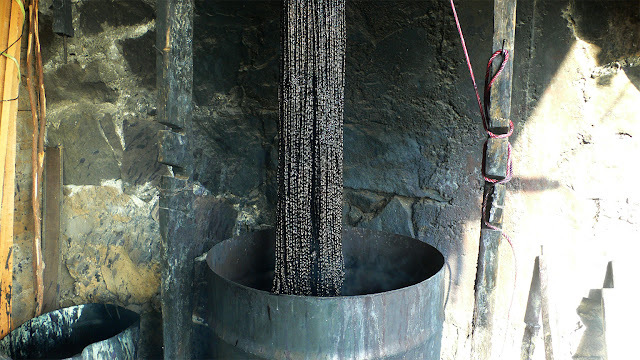 "Once you decide to use flour, you have to find a way to remove the flour, because the flour makes the yarn very rigid. To soften the yarns I put them into water with detergent. Once they are soaked I bang them against a stone, like the one shown in the video. 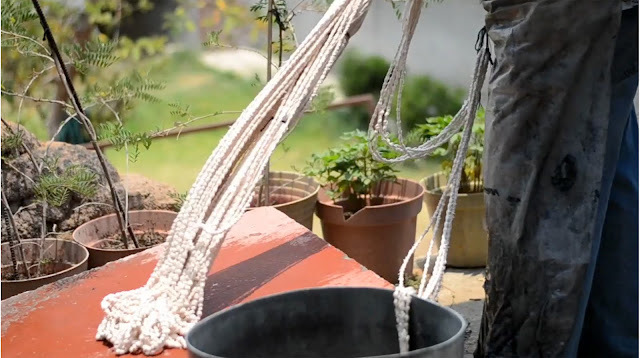 The process will also loosen the little knots, making it easier for the color to penetrate into the yarn. This procedure is only necessary when the flour is used." 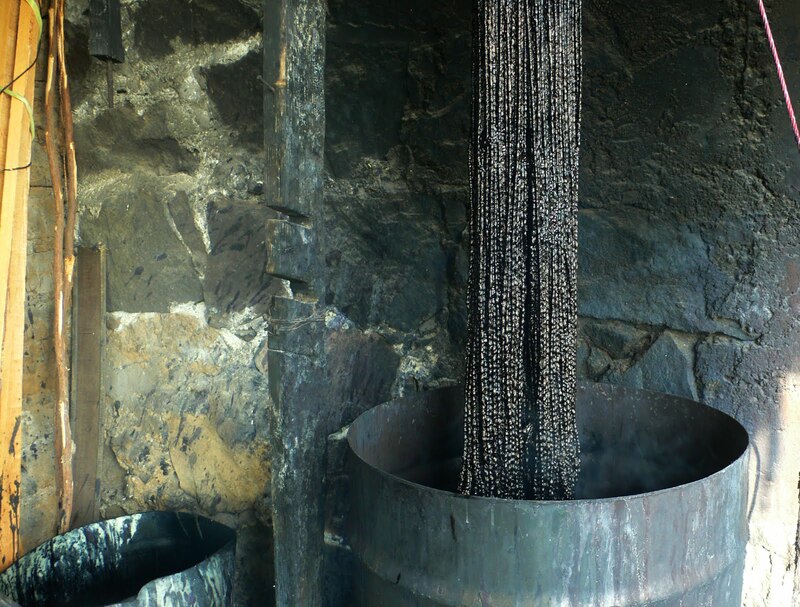 "Once knotted, the skeins of yarns are lowered into vats of dye -- natural indigo for blue, cochineal dye for red, and often synthetic dyes to create more varieties of colors. Sometimes I use a single dye vat, and produce a gradation of colors on the yarns -- making a [tonal gradation] going from light to dark, for contemporary designs -- the results are quite beautiful." "I'm good at this because I keep the tradition but I'm always open to new kind of designs, creations and inspirations. People that are familiar with my work visit me and express some ideas they have in mind. I always try to make exactly what they want, always keeping the old tradition of the Mexican rebozos." Luis uses a large carving knife to remove the knots after dyeing. Working gently in a kind of 'guitar-strumming' motion, he removes blocks of knots at a time, greatly accelerating the knot-removal process. "I don't know exactly when the knife started to be a tool for the IKAT procedure. I only recall that my father used to work with it since I was a child. Now, as you can see, I'm using a more traditional knife, but long time ago, they used to work with a piece of metal very different than a knife." "I like to play with the technique that my father taught me long time ago. This design, you see in the video for example, is my creation. It is different than other rebozos. 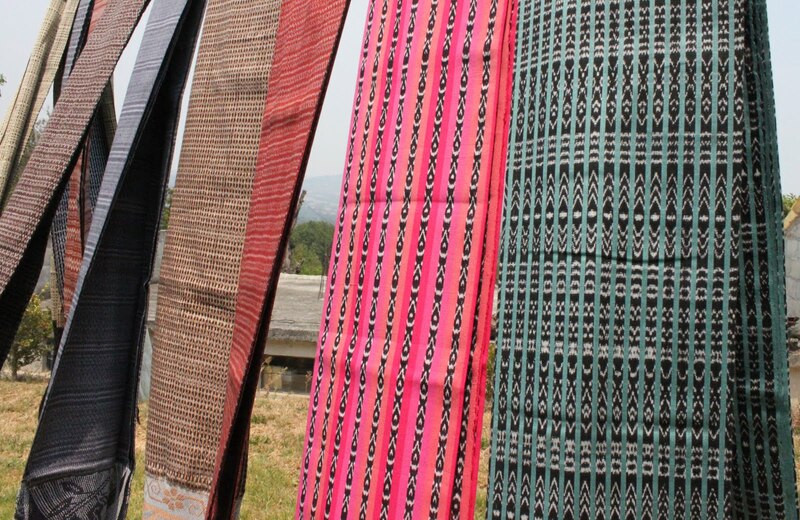 The weaving is a combination of colors and forms that traditional rebozos don't have. People that are experienced with rebozos tell me that my designs are different -- not the customary traditional designs that are available for purchase. They are always asking me about the process I use. I am always looking for new ways to innovate, to create original designs with the traditional methods." "My principal challenge now is to improve and create a bigger business for my children. 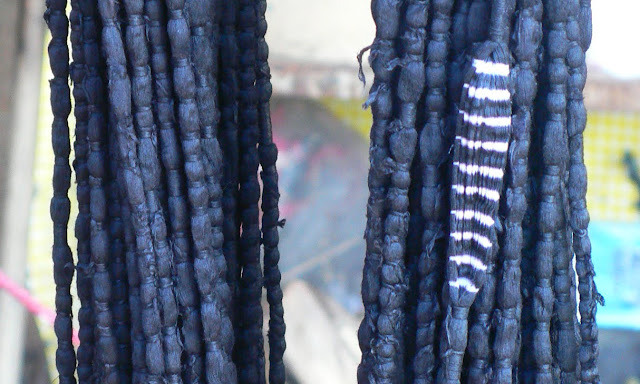 I want to be able to produce more rebozos and grow into a specific market of design. 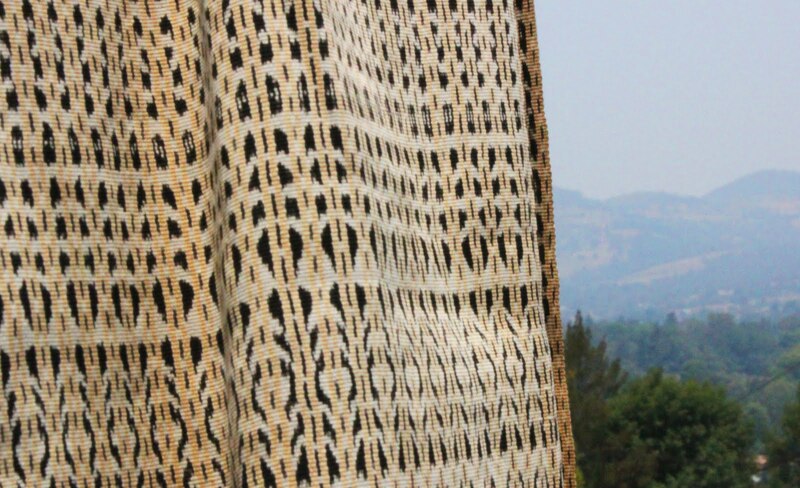 Another big challenge for me would be to keep working and creating this kind of rebozos with my own designs and techniques for a long period of time, so that in the future I could improve the environment in the company and keep doing my products with the best quality to compete with any kind of textiles in the world." Thanks to Ricardo Hoseguera -- our guide, translator and still photographer for the journey to the town of Tenancingo, Mexico. Thanks as well to Alex Khaskin, the composer of the song, "Mexican Guitar", which provided the fluidic background music for this short film and travel log.